1. Preheat the oven to 150°C, gas mark 2. Place the egg whites in an electric mixer and whisk on high until stiff peaks form. Gradually add the caster sugar, one tablespoon at a time, waiting 30 seconds before adding another. Once all the sugar is in, whisk for a further 6 minutes or until the mixture is stiff and glossy. Scrape down the sides of the bowl, add the cornflour and vinegar, and whisk until just combined. 2. Shape the mixture into a 22cm round on a baking tray lined with non-stick baking paper. Reduce the oven temperature to 120°C, gas mark 1, and bake for 1 hour 30 minutes. 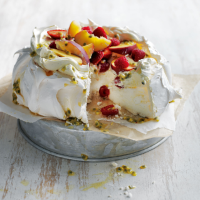 Turn the oven off and allow the pavlova to cool completely in the oven. 3. To serve, place the cream, icing sugar and vanilla paste into a bowl, and whisk until soft peaks form. Spoon the cream over the pavlova. Top with sliced stone fruits, berries and passion fruit. Serve immediately.